So, have any of you shopped with Plus Size Dresses? They're a site that features dresses from numerous designers and shops including Simply Be, Joana Hope, Agenda, JD Williams, Julipa, and several others in sizes 12 to 32. What's cool is that you can browse and sort by sizes, designers, occasions,or styles. That being said, would you like to see my dream collection from Plus Size Dresses?! You know you do! 1. JD Williams Notch Neck – I love the color of this dress, Surprisingly, I don't own a single pink dress! Blasphemous, I know! I just adore this shade of pink. 2. 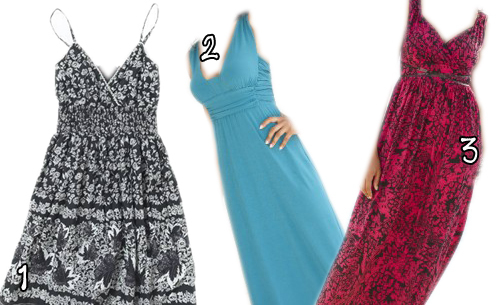 Pack of Two Jersey Dresses – Super cute, breezy, and inexpensive. 3. Joe Brown's Life and Soul – GAH!!! So adorable! I cannot handle how much I love this dress! The print is different than anything I own and that might be why I love it so much. Also? POCKETS! Pockets are my salvation and the idea of a dress with pockets!? It just makes me so giddy! Sigh, one day. 1. Joe Brown's Floral - I want to wear this dress while lounging by the pool. It requires bare feet, a big floppy hat, and a frosty alcoholic beverage...preferably with a giant chunk of pineapple and a maraschino cherry. 2. Fashion World Maxi - While I'm not a huge fan of maxi dresses on myself, I love the ruching at the waist and breast. And the color is really lovely. Surprisingly, I have no blue dresses and this shade would make a perfect addition to my closet. 3. Fashion World Print Jersey Maxi - Again, while not a fan of maxis on myself, the color and little belt detail make this a must have. Personally, I avoided the “advice” section as I'm not a believer in dressing to “flatter” your size. You should wear what you love and what makes you happy – even if a fashion magazine tells you to not accentuate your belly or thighs. If you love a dress that does those things, so be it! Rock that belly outline and thigh-hugging fabric! I do love clothing sites that show a collection of various stores and Plus Size Dresses absolutely offers that! Now go buy yourself something pretty!